From Scratch: Cookie Making Day! It's been a hectic month. Year, for that matter. And that all seems to culminate in December. To top that, the weather here has been dreary for the last month or more, which zaps motivation and makes it much harder to get good lighting for pretty pictures. So posts have been sparse lately, and I'm sorry about that. Anyways, this weekend, we actually ended up with no plans except for that we are scheduled to teach Sunday School on Sunday morning. NO plans. The weekend before Christmas. Things like this make me know that I married the right guy for me. We used to do a big cookie day with my in-laws when the minions and their cousins were teeny, but that kind of faded away as everyone got into school and got busy with life. I do miss it. Taking some time at home to work and bake together seems like a good project, especially if we are surrounded with dozens of cookies at the end of it! Long story short, when I got back from the store, I had about thirty comments and messages between Facebook and Instagram asking about the recipes. So I'm going to link up what I can here, and then get the rest to you as I can...I'm not sure how easy it will be to photograph during this cookie chaos! Macaroons: These are new this year. We all adore authentic,good macaroons, and because of that, I've been terrified to even attempt to make them. Seeing the recipe from Flour Bakery's cookbook gave me a gentle nudge, because I know they use French techniques and these should be spot on. Closest I could find to link you to is HERE. Jello Cookies: Guilty pleasure, and another family recipe of mine. I know there is nothing natural about a bright green cookie, but you would be surprised by how well the flavors of lime Jello and red hot cinnamon candies meld. Plus, we get to use a cookie gun. Awwww yeah. PB Kiss cookies: Remember the Friends episode where Phoebe had the recipe for cookies passed down for generations...from some guy named Nestle Tollhouse? This one's on the bag of kisses. Or you can find it HERE. PB Balls (aka PB Bonbons): This is a recipe from the hubs' side. It's basically crunchy peanut butter, upped with powdered sugar, with rice krispies added for texture, rolled into balls and dipped in chocolate. Dipped. In. Chocolate. It's like a homemade, crunchy, Reese's ball. I eat them until I see sounds. Grandpa's fudge: It is exactly what it sounds like. My grandpa always would make fudge. I have his recipe card. I haven't made it since he passed away almost 7 years ago. It's time. Banket: Another gem from my family that I will probably leak a few tears while making. My mom's cousin blessed me with the actual recipe that my great-grandma wrote down for her. It's a delicious pastry loaf filled with an almond paste confection. My great-grandma would always have plenty, and my uncle took up the task for a while after she passed away, but it's been a while since I've had the homemade stuff. We pick up some occasionally at the Dutch market, but it's just not the same thing. I'm looking forward to showing my family what real Banket is like. Sugar Cookies: This one is one of the most authentic cookie recipes I have. It comes straight from the man himself: Cookie Monster. No joke, I have been making these since I was a child. I had the recipe in my Sesame Street Encyclopedia set. Volume C. They are so good and so buttery! Om nom nom nom nom nom!!!! You can find Cookie's recipe HERE. Jan Hagels: This is one from the hubs family, which seems funny because it sounds much more Dutch than his Italian/Russian/Irish/German blend. It's a delicious cinnamon and walnut crispy cookie. You can Google it and find a ton of recipes. (Turns out, it IS Dutch, but they usually use almonds...of course. We Dutch are a little almond obsessed.) But I couldn't find one the same as my mother-in-laws, so I'm not going to post a link, in case it's not as good. I will, however, ask her for permission to write them up for the blog sometime. Cherry Jems: These are my Christmas cookie obsession this year! They are from Pioneer Woman, and is anything she makes ever bad? I love the festive colors, and they are so easy to throw together! It also makes me happy that, while the recipe only uses the yolks of the eggs, I can use the whites to make meringue cookies afterwards! You can find the Cherry Jems recipe HERE. Forgotten Cookies: These are my meringue cookies, another family recipe. Fantastic, airy, crisp, sweet...and you just throw them in at the end of the baking day and wake up in the morning to beautiful, delicious cookies. I blogged about them HERE. Popcorn Cookies: These are from the Smitten Kitchen cookbook, and I'm just too curious about them not to give them a try. Salty and sweet is my heaven. Find the recipe HERE. Vamino Bars: These may be my most favorite thing my grandma ever made. They are layers of chocolatey minty deliciousness. I'm sure the recipe is not original, and I've also heard people call them "namino bars", but I haven't found her version of the recipe online. Hopefully I'll change that with a blog post in the near future. Rosemary Shortbread: Another new addition this year. Sounds too Christmasy to pass up! It's a recipe that can be changed up many ways, and it's from Melissa Clark, one of my favorite food authors. You can find her recipe and some fun variations HERE. Pizzelles: This comes from my dad's side of the family, specifically my Dutch/Italian uncle. Who is actually my Godfather. I love it. And him. And these cookies. I bought a pizzelle iron just to make these. You can Google up and get a ton of pizzelle recipes, but his uses both anise flavoring and anise seed. Which may sound like they are going to smack you over the head with licorice flavor, but they don't at all. It's so subtle that even people who hate licorice fall for these. I've already made 4 batches this year, but we are out of them...so hopefully we'll sneak in a batch or two more today. Rum Balls: I just realized that I totally forgot to get Nilla wafers for these. So they might not happen. I might just have to pour the rum into a glass at the end of all this cookie chaos. Anyways, Emeril Lagasse's recipe is supposed to be divine. You can find it HERE. Also, not listed is my mother-in-laws pecan balls, which are a must-make for us. My family made pretty much the same thing with walnuts when I was growing up. Last year, I made them with chestnuts, and I drool just thinking about those cookies. Nut balls. Yum. Seems like everyone has this one in their recipe box. So, that's the plan. Ambitious? Yes. Crazy? Probably. Delicious? Absolutely. 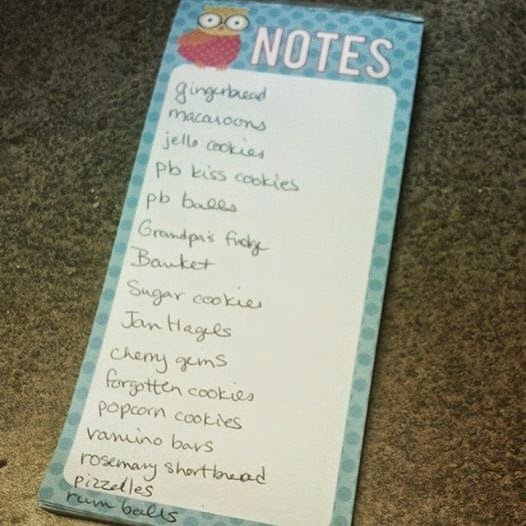 What cookies make your list?